Do you often feel that there is more to do than time available? Overwhelm is a common issue in the workplace and among business owners trying to be across everything. This “not enough” feeling, however, triggers your body’s stress response, releasing adrenaline and shifting how you work and think. As pressure builds and your adrenaline kicks in, your desire to move quickly increases. For most people, moving quickly means trying to multitask. However, the latest in neuroscience has called into question our ability to multitask and the impact dividing our attention is having on our brain and productivity. In her book Make Your Brain Smarter, Dr Sandra Bond Chapman, says, “The brain’s frontal lobe has to quickly toggle back and forth while performing two tasks”. While you feel like you are doing two things at once, what you are actually doing is rapidly “task switching”. “Task switching” takes a toll on your brain. Bond Chapman explains, “…Your brain is built as a single channel action system with limited capacity; it bottlenecks when trying to do more than one thing at a time…” This is why when we divide our attention, we get tired, work more slowly, make more mistakes and fail to deliver our best work. A divided brain is not a smart brain. With busy schedules and massive to-do lists, the work might not be going away, but your approach to how you tackle your day can. By implementing these three steps, you can begin to re-wire your brain for greater focus, clarity and productivity. Do you feel that you should be able to get through everything? Are your to-do lists more like “brain dumps”? 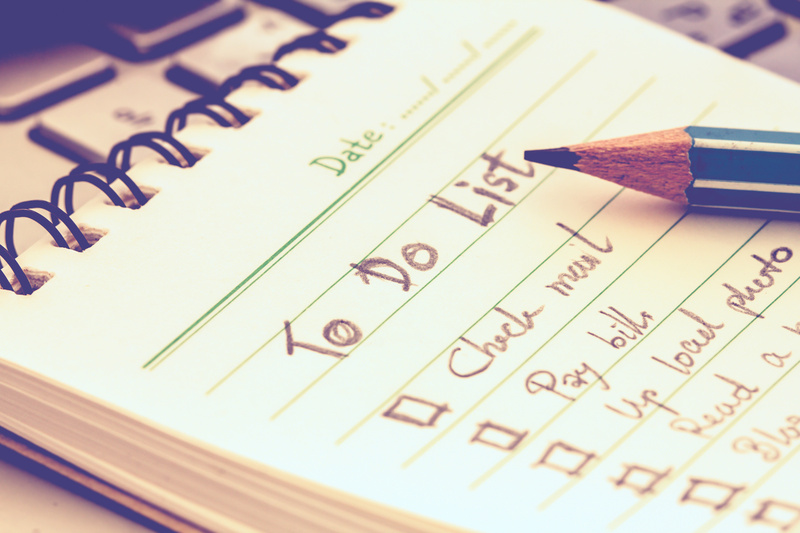 Setting massive to-do lists only overwhelms your brain from the outset. With a limited amount of time each day, there is only so much you can do—use your brain power wisely. Start the day by getting clear on what matters and choose only three core tasks you will complete. Three tasks may seem unrealistically small. However, by choosing only three tasks you limit what you are asking your brain to focus on during the day. Focus allows your brain time to get into flow, releasing the pressure and stress of knowing there is a long list of tasks to be done. If you find there is extra time at the end of the day to work on more tasks that’s fantastic, go for it. Considering most tasks take longer than estimated to complete, limiting your focus ensures you end the day satisfied that you’ve been productive and progressed on tasks that matter. When you complete a task and end the day feeling productive, your reward centre is activated and you get a hit of dopamine, one of your brain’s feel good chemicals. Dopamine has been linked to motivation which is why as you complete tasks you feel inspired and energised to keep going. By re-thinking your to-do list you can increase your focus, productivity, work satisfaction and motivation. Your brain loves being able to focus on one task for a period of time. This can be challenging with the amount of distractions we face each day. To keep your brain in flow, you can begin to design your day to include task batching. Task batching involves grouping “like” tasks together and doing them in one time slot. For example, you may choose a time in the day to reply to all your emails or make non-urgent phone calls. You can also look at what type of thinking your tasks require, and batch similar tasks together. This might mean you keep tasks that deal with numbers together and tasks that require creative thinking together. This strategy is one of the easiest ways to “buy back” time in your day. Too busy to stop? Most people either have no lunch break or eat while still at their desk working. When the work piles up it’s hard to hit “pause”. The truth is, the more crazy busy you are, the more you need to stop. Bond Chapman explains that our pre-frontal cortex, the part of our brain involved in deep, critical and focused thinking, works best when it isn’t overworked. A break is the smartest thing you can do in your day to ensure you are producing your best work in the most efficient manner. Take your lunch break away from your desk, get some fresh air, enjoy some sunlight, eat a healthy lunch and return with a re-energised brain. Even with the backing of science, it can be challenging to get your head around the fact that less is more. When you allow your brain to focus, limit distractions, stay in flow and rest a little, you will notice how much more you get done and how great you start to feel. Re-think how you approach your day and start working with your brain rather than against it. Jessica Lee is a neuro-wellbeing writer, speaker and business consultant. She is the owner of The Spark Effect and is passionate about sharing neuroscience-based strategies to enable individuals, business owners and corporate teams to change how they think and work. She shows people how they can better use their brains to reduce overwhelm and stress, while boosting productivity, creativity and wellbeing. After suffering burnout herself, followed by a seven year journey with Chronic Fatigue Syndrome, Jessica knows personally the cost of burnout and what it takes to recover and rebuild. Through her work she is determined to challenge the assumption that burnout is the necessary price we pay for achievement and success. She is passionate about showing why wellbeing is the key to optimal brain performance and sustainable achievement, not a barrier. Jessica has featured in Australia’s leading wellness and mindset magazines including, The Sunday Telegraph’s Body and Soul magazine, WellBeing and Australian Yoga Life. She has also worked with corporations including Commonwealth Bank, Blackmores and Curves.